@ShaynaCat and @Kingtuttifruiti enjoying their first dance as husband and wife. Sunday, June 26, 2011, Catnip Island – It was the feline wedding of the year. A romantic ceremony at a luxury Caribbean resort followed by a plush reception, guests attending the wedding of @ShaynaCat and @Kingtuttifruiti partied into the wee hours of the morning. The bride and groom kicked off a long night of dancing and celebrating. 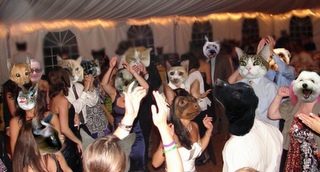 Drinks were flowing all night long as #Nipclub mixologists served up tropical catinis and pink champagne. Guests dined on gastronomical delights like mango tuna, burgers with nip sauce, shrimp and pastas. And the sweetest dessert table offered delectable pastries, catnip brownies and catpuccinos. @LilyLuWhoT and @Pandafur looked stunning in their pink couture gowns. And, rumors were rampant about a number of suitors seeking the paw of maid of honor @TinyPearlCat. The wedding festivities took up half of Catnip Island. Tight security measures prevented spectators from accessing the resort. No word yet on who designed the bride’s dress or the cost of the lavish event. We’re betting it cost catillions of dollars. All photos courtesy of @ShaynaCat and @Kingtuttifruiti. Additional wedding images available at http://ktfscpix.blogspot.com. This entry was posted on Sunday, June 26th, 2011 at 7:57 pm and is filed under Feline Lifestyle. You can follow any responses to this entry through the RSS 2.0 feed. You can leave a response, or trackback from your own site.